In 1967 Dunn and Dunn they presented a learning styles model that focused on five categories: environmental, emotional, social, physiological, and psychological. They believe that learning styles change and develop over time. Dunn and Dunn stated that teachers need to help students and make changes so that all students can learn. Changing the layout of the classroom or how students work are just a couple of examples. They use "contract activity packages" to make this work. 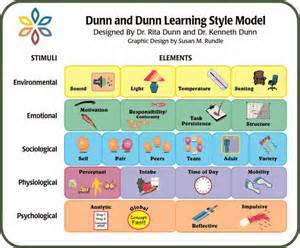 If you're interested in learning more about this, there are a number of good books written about Dunn and Dunn's learning styles. You might also be interested in . . .